If they were mine and I was keeping them, then I would add feet on the end and a clear plexi cover over the controls with velcro. Rob - hope you had a great time at Evan's shin dig. For anyone that is interested in seeing photo's and get more of an explanation on what happened at his show - Evan drove the rig a little hard, so I heard. Check it out in the basement. Back to FBT business, I understand you left the wedges with Evan is that correct? Evan, please be gentle and call home if anything happens to them. Yes, the FBT wedges were turned over to Evan at breakfast on Sunday morning (after embarasing Evan out of bed ). I used one the evening before Evan's bash and will post a writeup after I get home from Thanksgiving with the in-laws. The evening before Evan's bash I used one FBT wedge for a singer songwriter at a small venue. There were about 100 people there. 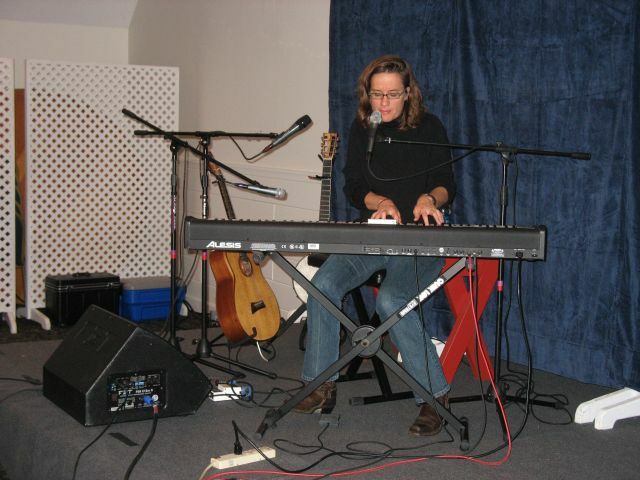 The performer used the wedge for vocals and for the electric keyboard as well as her guitar. There were 2 vocal mics set up with one directly in front of the wedge and the other at an angle to it plus one for a banjo. She was aprehensive about feedback what with up to 3 open mics in close proximity to the wedge. We dialed in the monitor during sound check and had no sign we were going to have any feedback. No ringing at all. I asked her about it after and she was very happy with it. So, therefore I was very happy with it too. The day before the gig I took off the grills from the wedges and removed the "Bennett Memorial Boot Prints" from them so Evan would have good looking wedges to start out with. At Evan's bash I attempted to give Evan the wedges but he, predictibly, had no room in his vehicle that night. Well, I wasn't hauling them 400 miles north again so Tom Brandis was kind enough to put them in his van for the night. Thanks Tom! The next morning at breakfast Evan collected them from Tom. I really liked the FBT wedges and if they were a bit lighter and I could have afforded a bunch of them, I would be very happy to use them on any gig. Thanks to FBT and Pro Sound Web for letting me use them. At R&R levels do you hear any breakup in the HF section? How visible are the clip/limit indicators? They look tiny. Do they stay lit for a second? or are they super fast. Sound quality of the limiters in the circuit, how do they sound? Like, Nasty clamp with slow release, or Relatively fast and transparent. "Corporate policy says I can't use my employer's name on the internet"
In the time I had them I never once hit a limiter or saw a clip light. They were ripping my head off with volume and still nothing. Seems like these are real sleepers as far as bang vs. buck. I'm sure you're friendly FBT dealer can make you a better offer. If you have any other questions on the FBT's feel free to ask. We have been using four of the PSR 212MA's this summer with excellent success (everything from street fairs to bluegrass festivals to small college rock fests). Just an FYI, the FBT website and the dealer price sheet specs the amplfiers at 500 watts RMS for the 12" and 150 watts RMS for the high-freq. Is this correct? The passive units are more than the active ones? The passive units are more than the active ones? Mind you that is in Australian Dollars but the point is illustrated.